If you like in an older property in the UK and never looked under the carpets you might want to take a minute and have a look. 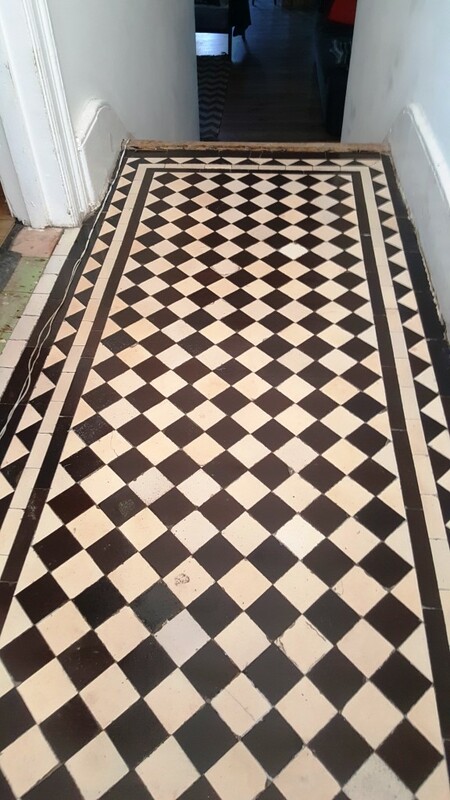 I still find it surprising how many of my customers had no idea they lived in a house with a classic tiled hallway. 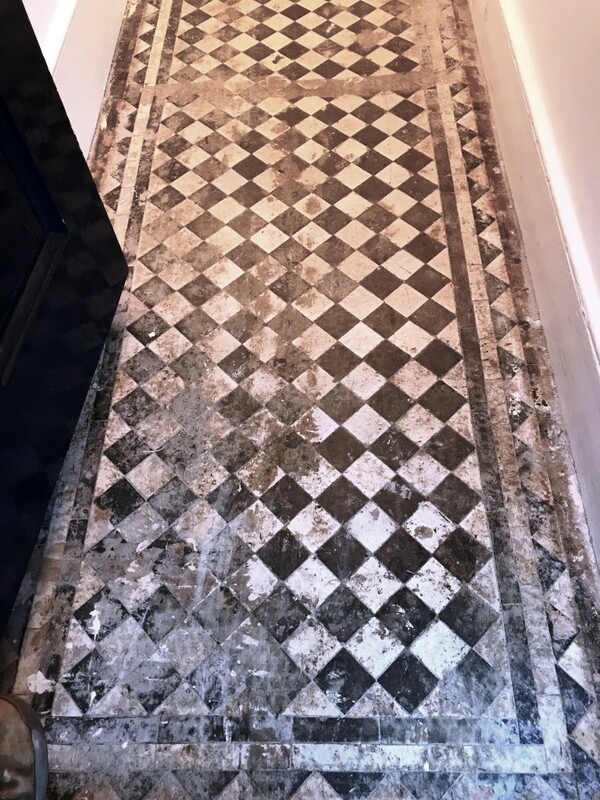 We were recently asked to restore a fantastic geometric-patterned Victorian tiled floor which had been found underneath carpet during decoration work in the hallway of a property in Streatham. The once black and white tiles were now absolutely caked in dirt, glue deposits, cement, paint stains and plaster. It would be no small feat to get the tiles back to looking their best again. 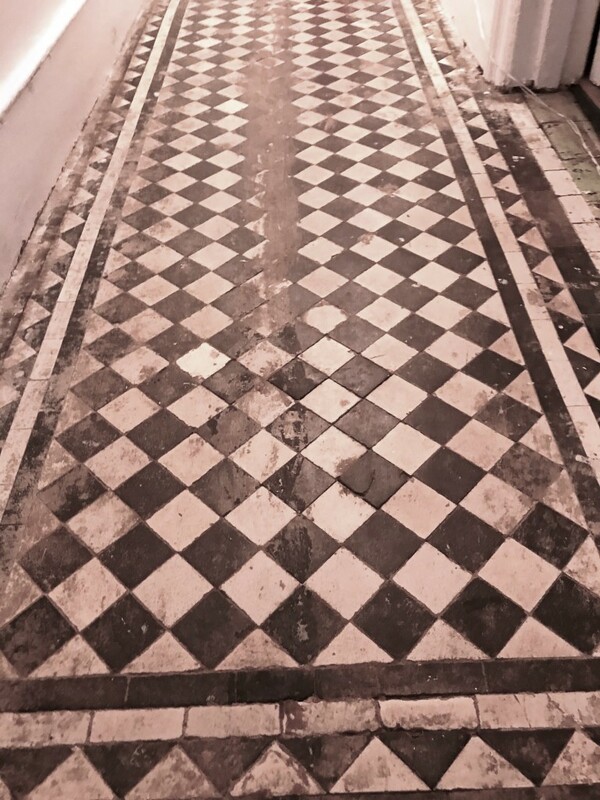 Fortunately, Victorian tiles are very resilient and we have a lot of experience in their restoration so I was confident that with the right products and techniques we could get the job done to a high standard. The tiled hallway was quite long, yet only around a metre wide, so I felt the best approach would be to work in small sections at a time. Our method was to soak the tiles with Tile Doctor Remove and Go and leave the product to work its magic for roughly ten minutes, before scrubbing the surface to remove the muck. Some of the more viscous and stubborn stains were scrapped away carefully by hand within the assistance of a steam cleaning machine. The resulting residue was extracted using a wet vacuum. Remove and Go is a particularly effective cleaner in scenarios like this, as it is specially formulated to strip away old sealers, adhesives and even paint without harming the tile itself. The next step was to run a rotary machine fitted with a Coarse 200 grit burnishing pad lubricated with water over the floor to achieve a consistent finish. The floor was then rinsed to remove the soil generated in the process. Old floors like these laid before the invention of damp proof membranes can be a concern as damp rising up through the tile as it dries can leads to efflorescence salt deposits appearing on the tile surface. So, to avoid potential issues Tile Doctor Acid Gel was applied to the floor to neutralise any salt deposits and the floor given a final rinse to remove any trace of cleaning products. After finishing the clean, we left the floor to dry out over the weekend. With old floors like this one, we tend to recommend allowing a drying period of at least 48 hours to ensure the floor is completely dry before applying a sealer. Upon arriving back at the property, we ran a few quick damp tests and once satisfied the floor was dry proceeded to seal the tiles using Tile Doctor Colour Grow. Colour Grow is a colour-intensifying, impregnating sealant that leaves a natural-look matte finish. It works by occupying the pores in the clay and it’s also a fully breathable sealer which is important for these old floors where damp may be any issue. The customer was absolutely thrilled with the results. She even went as far as to leave a review expressing how pleased she was during the weekend before we had chance to seal the tiles. Bill and Wayne were brilliant! On time, got to work straight away, lovely and friendly and very professional. They have done a lovely job and I’m looking forward to them coming to seal the tiles to finish it o f tomorrow afternoon. Wouldn’t hesitate to recommend. Thanks guys! 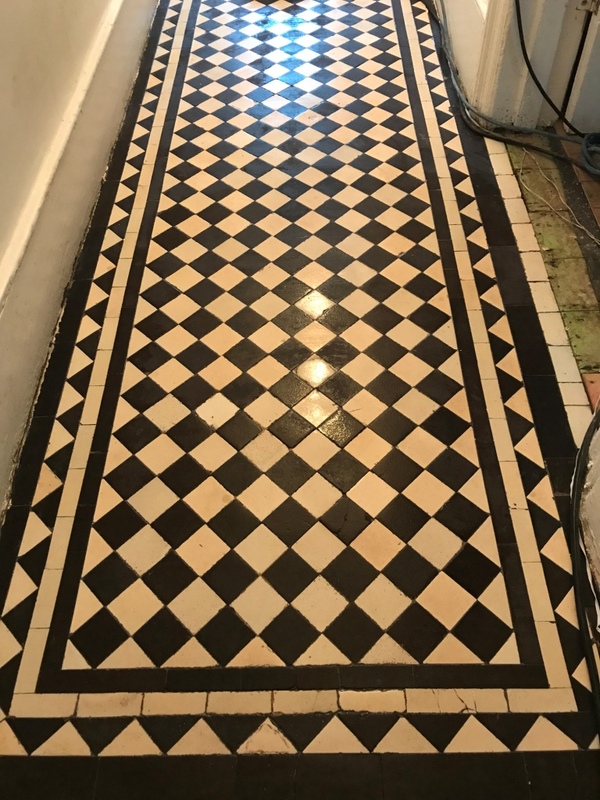 This entry was posted in Victorian Posts and tagged Geometric, hallway, Streatham Tile Cleaning, Streatham Tile Restoration, victorian tile cleaning, victorian tile restoration, Victorian Tile Sealing by AbzDominise. Bookmark the permalink.